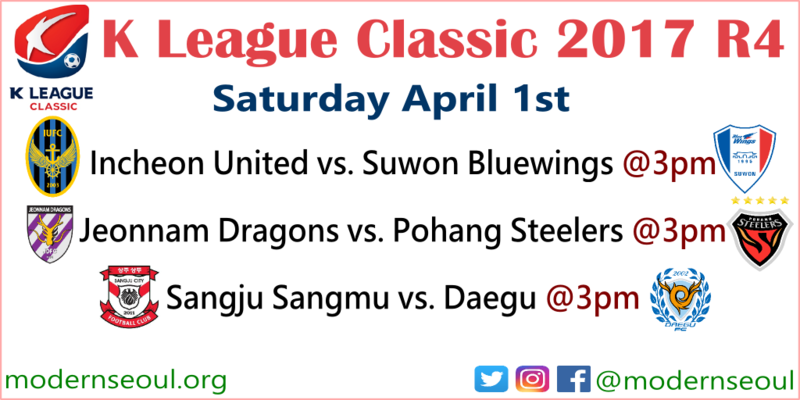 The K League Classic returns following the International Break on Saturday afternoon, whilst the K League Challenge contains following mid-week FA Cup Matches. It’s been a slightly slow but interesting start to the 2017 season, with Jeju United being the standout side so far. Of course following just 3 games the league table doesn’t reflect a probable final table, but it does make of nice viewing for a few sides. Jeju lead the way with the only perfect record. 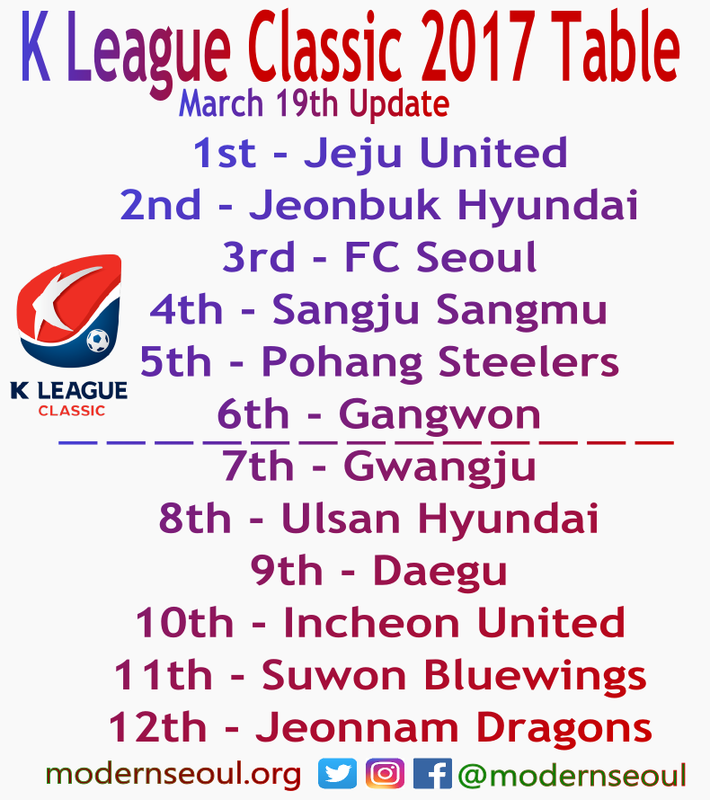 Jeonbuk and Seoul follow them on 7 points. Sangju are next on 6, whilst Pohang and Gangwon have 4. Gwangju and Ulsan currently have 3 points. Daegu, Incheon and Suwon Bluewings all have just two points. Finally Jeonnam are bottom and currently pointless. Our highlight game of the day comes from the Incheon Football Stadium (Sungui Arena Park). Incheon United haven’t looked great in their opening 3 games, but did hold Jeonbuk Hyundai to a goalless draw two weeks ago. Suwon Bluewings are level on points with Incheon with only 2 so far this season. Last Time: Suwon Bluewings won 3-2 last November. Strangely all of the goalscorers during that game have moved to new clubs. When Incheon and Suwon meet there are generally goals, and therefore we’re siding with an entertaining draw. The second 3 o’clock kick off comes from the Gwangyang Stadium home of Jeonnam Dragons. Jeonnam Dragons have had a bad start to the season losing all three of their games so far, they also have the worst defensive record in the league. Pohang Steelers have been mixed in their opening games picking up 1 win, 1 draw and 1 defeat. Last Time: Jeonnam Dragons won 2-1 in August last year. Despite being away from home, we see Pohang being the side to beat here. The finally 3 o’clock kick off on Saturday comes from the Sangju Stadium, where Sangju Sangmu host Daegu. Sangju Sangmu lost their opening game of the season, but have won their last two and are certainly starting to gel. 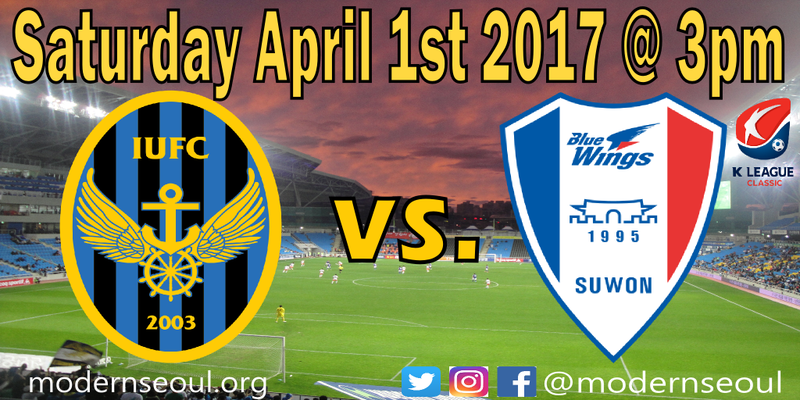 Daegu have drawn their previous 2 games against Incheon and Suwon Bluewings, but lost on the opening weekend to Gwangju. Last Time: Daegu won 5-1 back in September 2015. Sangju win start as favorites in this one. Incheon United comeback from 3-1 down to draw 3-3 in the best game of the 2017 season so far. Sangju Sangmu and Daegu played out an even 1-1 draw. Finally Pohang condemned Jeonnam to a 4 straight defeat. 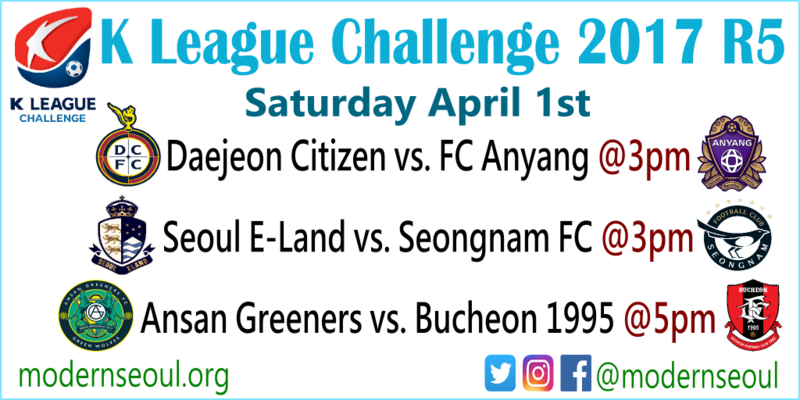 Saturday afternoon and evening also features three games in the K League Challenge. 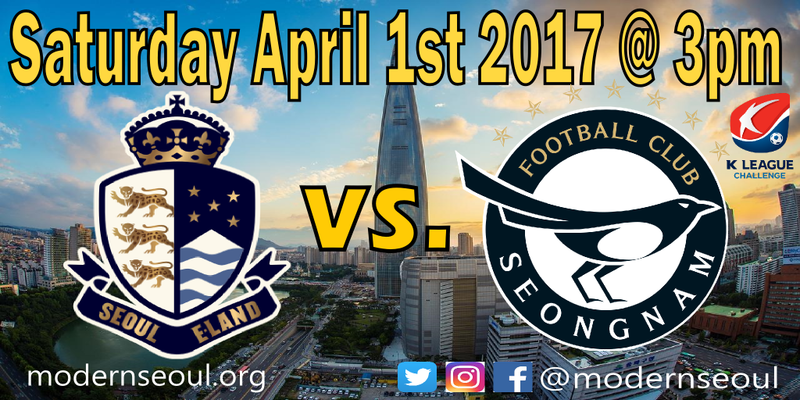 The local derby between Seoul E-Land and Seongnam FC is a standout clash. The league table after just a three games has Gyeongnam topping the table, followed by Asan Mugunghwa, Suwon FC and Busan I’Park who currently fill the playoff places. Bucheon 1995 and Ansan Greeners follow close behind. Daejeon Citizen, Seoul E-Land and FC Anyang are already a little off the pace. 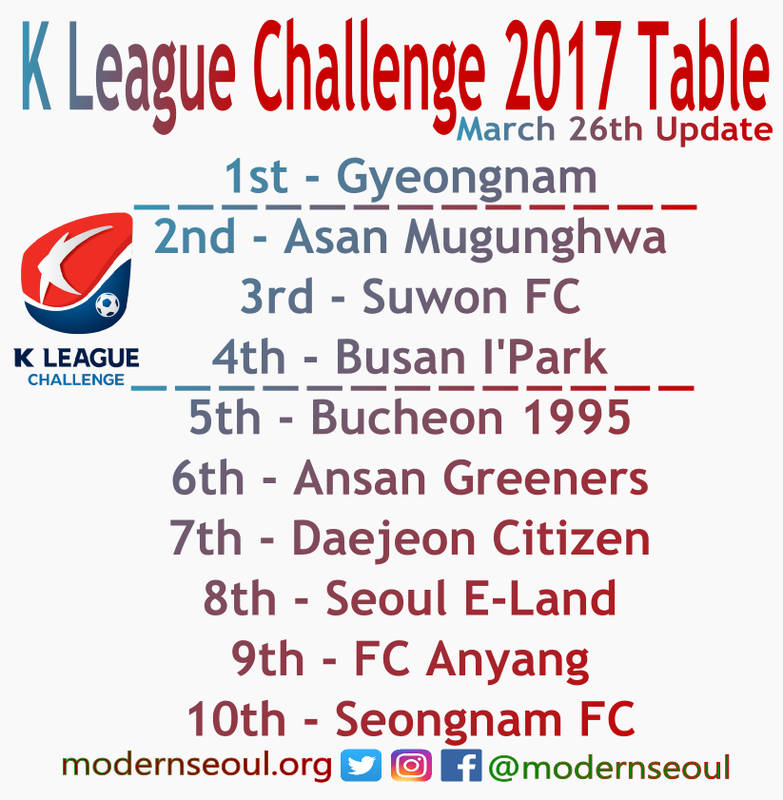 Finally we have Seongnam FC who only have 1 point and 1 goal from 3 games so far this 2017 season. The first game in the Challenge this Saturday afternoon comes from the Daejeon World Cup Stadium, and is between Daejeon Citizen and FC Anyang. Both sides have had disappointing starts to the season, both have just a single win from their opening 4 league games. However they both won tricky cup ties during the week and so may come into this game with a spring in their steps. On paper at least Daejeon should win this one, however FC Anyang looked improved against Seongnam last weekend so it maybe tight. The highlight game of the day comes from the World Cup Stadium, and is the first ever game between Seoul E-Land and Seongnam FC. This is a local derby of sorts as geographical they are close (but in different cities). Seoul E-Land have 1 win so far this season, coming last weekend. But crashed out of the cup to 4th tier side Pocheon FC. Seongnam FC are still looking for their first regular time win since last September, but did win in the cup during the week on penalties against Suwon FC. Form wise a close game, but we see Seongnam finally coming to life and picking up a valuable three points. 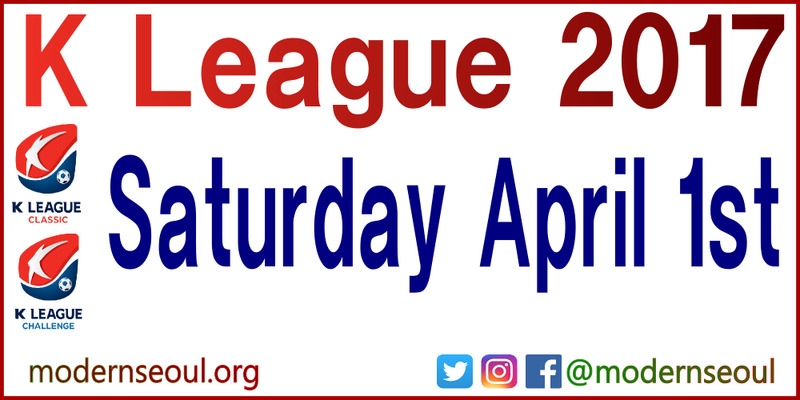 This Saturdays late game features the two sides currently mid-table, Ansan Greeners and Bucheon 1995. Both sides have the same record so far this season with 2 wins and 2 defeats. Sadly Ansan lost in the cup during the week, but Bucheon 1995 eased through to setup a rematch with Jeonbuk Hyundai. Although neither side has drawn so far this season, we see it ending all square as they are evenly matched. Seoul and Seongnam played out a woeful draw, things can only get better for both sides. FC Anyang however picked out a solid win on the road against Daejeon who finished with only 10 men. Bucheon won the late game to put themselves back into the playoff picture.